The catastrophic spill from Brazilian company Vale’s Brumadinho mining waste dam in Minas Gerais state is the second massive waste dam collapse in Brazil in recent years. The last one was at Mariana, in the same state, in November 2015, at the Samarco iron ore mine owned by Vale and London-listed mining company BHP. LMN published a report on the aftermath of that disaster in 2017. The 2015 Samarco disaster had a much greater environmental impact, but Friday’s disaster seems to have taken perhaps fifteen times as many lives – up to 350 people were said to be still missing early on Saturday 26 January, and may be dead, and estimates of the numbers seem to increase by the hour. London Mining Network has been calling for years for stricter regulation of the mining industry, including tightening of standards in mining waste management. The mining industry continues to ignore expert recommendations and research. Minas Gerais news outlet, O Tempo, reported that Brazilian authorities at the National Mining Agency had categorized Vale’s dam as “low risk” for accidents, but “high potential” to cause damage if accidents were to occur. “Vale’s Brumadinho mining waste dam failure is all the more tragic because the mining industry knows how to prevent them, yet failed to act. 200 people are missing and some presumed dead because Vale and the rest of global mining industry haven’t adopted the Mount Polley Independent Expert Panel’s recommendations made in response to a similar catastrophic mining waste dam failure in 2014. These recommendations have been globally recognized, including by the United Nations Environment Programme’s 2017 assessment of tailings dams failures, and by the multi-sector Initiative for Responsible Mining Assurance standard. Until these recommendations are adopted and independently verified, preventable mining disasters will continue to occur wherever the mining industry operates. Independent research that analyzes mine waste dam failures since the turn of the 20th century reveals that these catastrophic failures are occurring more frequently. It also projects the trend will continue, driven by economic factors.” Nonetheless, after the 2015 Samarco disaster, the International Council on Mining Metals published mining waste impoundment guidance that ignored the globally recognised recommendations by the Mount Polley Panel. In the video below, you can see the site of the disaster, and hear eye-witness testimony from Rodrigo Peret and an activist from MAM, the Movement of People Affected by Mines. We weep with Mother Earth tears of mud and blood. We are writing today from this devastated community, which we know after visiting it many times during its resistance to the expansion of mining. We also write in behalf of the many communities in Latin America affected by the violent arrogance of extractivism who share the tears of Brumadinho. 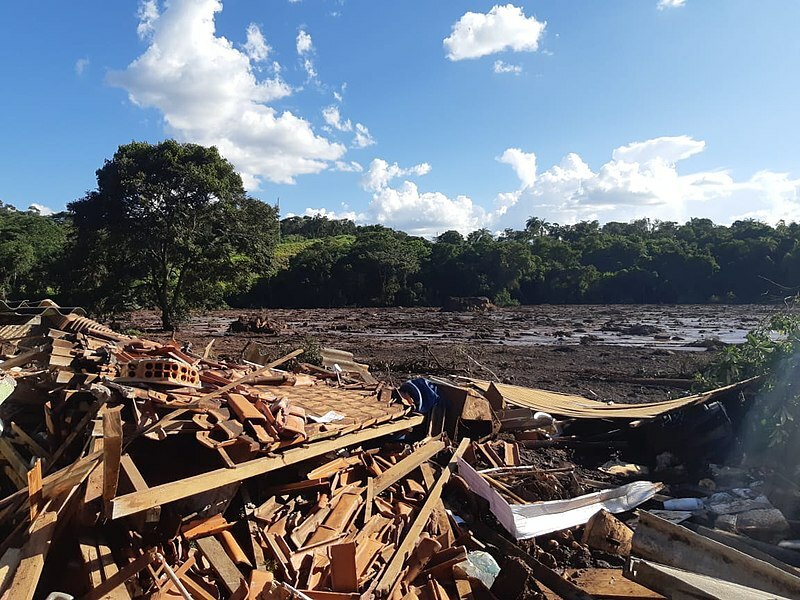 We continue our accompaniment and advice to churches who work in areas damaged by mining and suffering from conflicts between mining companies and with in all open communities (There ae such conlficts in 70 Dioceses in Brazil.). The company VALE SA, together with BHP Billiton, was responsible for 19 deaths and pollution of the entire Doce River basin, on November 5, 2015. The same damage has occurred, three years later, leaving a trail of many more deaths, and is the confirmation of the incapacity to prevent of damage and of its disinterest and criminal behavior. This responsibility also involves the State, which grants licenses for mining projects and which should monitor them to guarantee the safety and security of communities and the environment. The State’s responsibility is twofold because impunity, and the lack of proper compensation for the victims of the crime of Mariana, was one of the main conditions that allowed the new crime of Brumadinho. Hand in hand, the capital of mining companies and political power facilitate the installation or expansion of large extractive projects, in practive paying little attention to the conditions laid donw in the licensing rules. The “Córrego do Feijão” project itself, where the tailings dam burst, in December 2018 obtained an environmental license to expand its activities by 88% . In the Council of Environmental Policies of the State of Minas Gerias, only the National Civil Society Forum on the Management of Hydrographic Basins (FONASC) voted against this expansion, denouncing “insane” mechanisms that reduced the environmental conditions in the licensing of large mining projects. Disasters caused by the irresponsible behaviour of companies allied to the public power can not be called “environmental accidents”. Since 2011, the population of Brumadinho and the region a have been demonstrating in an organized way against the mine, its impacts andits risks. FONASC, in December 2018, wrote an official communication to the State Secretary of the Environment, requesting the suspension of the licensing of the “Córrego do Feijão” mine. The International Organisation of People Affected by the Vale in the Shareholders’ General Assembly of the Vale, in April 2018, spoke up about “the dangers of the repeated process of reducing expenses and costs in its operations”, making explicit mention of the various waste deposits. Those responsible for these crimes cannot claim ignorance of the problems as a justification. On the contrary, in the name of progress and the profit of the few, there has been a systematic blocking out of different voices who have urged caution, who have identified the risks, who have asked for detailed conditions in mining licences and who ask for dialogue with the people threatened by, affected by and damaged by these projects. We loudly echo the words of Pope Francis in the Encyclical Laudato Si ‘: “in the debate, local inhabitants must have a privileged place – those who question themselves as to what they want for themselves and their children and can take into consideration the purposes that transcend the immediate economic interest “(LS 183). The newly elected President of Brazil, in response to the pressures of those who financed his campaign, announced a plan to make environmental control and licensing as flexible as possible. He criticized the alleged “industry of environmental fines”; his government stripped powers from the environment portfolio, suspended contracts with NGOs committed to defending the environment, and extinguished secretariats that worked for public policies against global warming. Previous governments have also facilitated the uncontrolled expansion of mining in the country, promoting the National Mining Plan and reformulating, by decree, the Legal Framework of Mining. Recent events demonstrate, violently, that these policies are a collective suicide and a threat to the lives of future generations. Frequently, companies and governments appeal for the mediation in conflicts with communities through “dialogue”. They even seek mediation by the churches, to offer these processes greater credibility. Also they have invested in extrajudicial mediations and agreements supposedly to make more effective and quicker the repair of damages and environmental violations. The lack of implementation of mitigations and reparations, the neglect to prevent new disasters and the repetition of irresponsible and criminal practices confirm that: this type of proposal is not a true dialogue. It is a strategy by companies to seduce public opinion, leading to a kind of social license to pollute, reduce popular resistance and avoid the issues of sustainability and the common good. We have more trust in the democratic rules of environmental protection and the rights of the populations, as well as in authorities that effectively monitor the respect for these rules and punish those who violate them, than we do in a “dialogue” that is asymmetric and disrespectful, We support a Binding Treaty for Business and Human Rights, at the international level, and a responsible, effective and prompt judicial response for those who hope for impunity. Socio-environmental crimes are not an accident!